What Kind of Louvers Are There? We produce louvers for all kinds of applications. What kind of louver do you need? The word louver refers to a set of angled slats used in doors, fences, or other openings to allow light and air to pass through. Louvers are used in architecture such as on roofs for ventilation, as well as on free-standing structures which provide privacy. They can be stationary in a fixed position or adjustable which means they can be opened or closed. There are different types of louvers for a variety of purposes. This kind of louver has gutters that channel rainwater to downspouts. This is a new technology that keeps out more rain than other types. Acoustic louvers are used for noise reduction purposes. They can be heavy and quite large. These louvers block out light and provide maximum noise reduction for those applications where it is required. To protect valuable HVAC equipment, a louvered enclosure keeps them safe without restricting airflow. 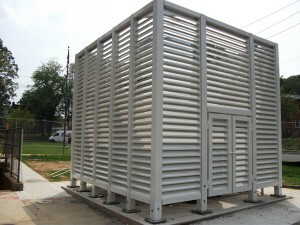 Custom HVAC louvers can be built to keep equipment safe and working properly. These structures are fabricated based on specific dimensions in order to enclose the designated space. Each gate can be customized to adjust for the amount of air and visibility desired. Aluminum fabricated louvers provide visual screening while keeping out dirt, water, and debris. Airflow is not restricted. These kinds of louvers have a smooth finish and use heavy wall aluminum for strength. Best of all, they won’t rust. Generators require proper ventilation to operate efficiently. Generator louvers serve dual purposes: letting warm exhaust air out and allowing cool fresh air in. Louvered screen enclosures can be used to keep noise out, for security purposes, and to enhance curb appeal. When you want to section off an area so that it is private, privacy louvers are the answer. They are visually appealing but they ensure your privacy because people cannot see through them easily. Just like an airplane wing, air foil louvers can increase or decrease the amount of airflow and sunlight depending on how they are angled. They come in a variety of colors and reduce up to 80% of the sun’s heat. This entry was posted on Friday, December 15th, 2017	at 12:42 pm	. You can follow any responses to this entry through the RSS 2.0 feed. Both comments and pings are currently closed.